WINNER: Robyn Wright from RobynsOnlineWorld.com! Congrats! In my last blog post, I talked about device theft and smartphone security including the importance of protecting the data on our devices. Because I manage my personal life and business using my smartphone, tablet and laptop, I need to plan for the potential nightmare of my technology being stolen. I simulated this scenario as part of Absolute Software’s #DigitallyDark challenge. This challenge involved going “dark”, with all devices turned off, for one day last week. Absolute Software solutions enable device location tracking, locking it against unauthorized users and data protection software that permanently erasing files from remote locations. 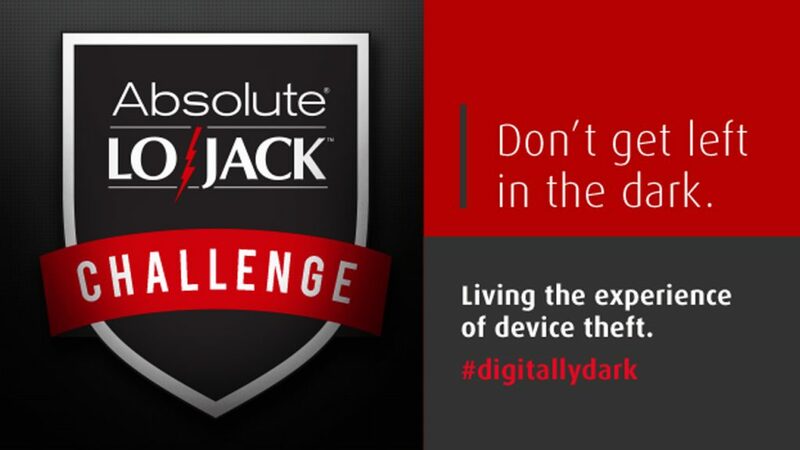 Their two device theft solutions are called Absolute Data Protect and Absolute LoJack. What happened when I went #DigitallyDark (yes, shriek of terror) for a day? 1. Contacts: I could not make any calls or access my contacts. Even though my data is backed-up in the cloud, I needed a device to get to the cloud!! 2. Data files: I did not have access to all my personal, professional and family management data files stored on my devices. Also off limits the software I use to run both my business and my family management. If the #DigitallyDark exercise had been a real theft of hardware, I would be forced to re-install some of this software from the disks, which hopefully are in a convenient location in my house. 3. Music Playlists: Even the music playlists that I listen to when relaxing and exercising were not accessible, so chilling out to music was not an option. 4. Security: The personal information on my phone includes passwords to payment software, so a stolen phone or notebook is a big financial risk. 5. Theft reporting: If my devices really were stolen, I would not even know where to start. Where would I report stolen laptop, stolen smartphone or even report a stolen tablet? Who should I call first? I could report it to the local police… and then what? If I had tracking on my device, should I pass that information to the police and ask them to track down my property? Using device theft solutions like Absolute Data Protect and Absolute LoJack would give me peace of mind and more of a sense of control because the software can locate the device, lock the device to prevent access of personal information, and permanently erase files in order to protect personal information and prevent identity theft. Absolute LoJack also has the extra features of recovery and guarantee. Absolute’s Investigation Team springs into action building a case and then presenting it to law enforcement (recovery) and provides a Service Guarantee to help pay for a replacement. As part of the #DigitalDark challenge get the opportunity to run a giveawa (6/19 – 6/25) where I will select one winner (at random) who will receive a family pack that includes FIVE -year Premium Absolute LoJack Subscriptions. STEP 1. “Like” Absolute LoJack’s Facebook Page. STEP 2. Comment on this blog post confirming that you liked the Facebook page and then share your thoughts on device theft. 1. One Blog Post comment per person. One Blog Post comment is equal to one entry (so only one entry per person) 2. Winners are limited to US residents only 21 years of age or older. 3. If a valid email address is not provided in the entry, another winner will be chosen. 4. The prize is not redeemable in cash and must be accepted as awarded. 5. Approximate value of prizes may vary. 6. All decisions are final 7. By entering any giveaway on this website you release Techmamas.com from any liability whatsoever, and waive any and all causes of action. 7. Contest ends June 25 2014 -10pm pst. Winner will be announced by June 27 2014. NOTE AS OF JUNE 27 – WINNER HAS BEEN CHOSEN AND CONTEST IS NOW CLOSED. But feel free to still share your thoughts on Device Theft! **Offer is good until June 30. Liked them on Facebook. I would be so totally lost if all my devices were gone in one swoop! I’m like you – everything about my life, both biz and personal, is all on my devices and clouds! Will have to check out more about their services.